NEW YORK CITY — Subway riders carrying iPhones and other fancy gadgets are not the only crime victims in the city's transit system this year — so is the MTA. Thieves have been looting Metropolitan Transportation Authority storage rooms, maintenance sheds and lockers throughout the sprawling subway system, DNAInfo.com New York has learned. There have been at least 18 break-ins of TA subway equipment rooms so far this year, compared to zero last year, according to MTA data. Theives have been getting away with tens of thousands of dollars worth of tools, mechanical equipment, pneumatic drills and various electrical gadgets used by workers, sources said. In most cases, the theives used bolt cutters to destroy locks to gain access to the equipment and other workmen essentials, NYPD officials said. At least seven of the break-ins are the work of the same criminal who went on a recent month-long spree in two major Brooklyn subway stations — a hub at Hoyt-Schermerhorn station in Downtown Brooklyn and at the Franklin Avenue station along Eastern Parkway in Crown Heights, police officials said. This “pattern” started April 29 at Hoyt-Schermerhorn station where the thief managed to walk off with $400 in equipment, officials said. Four days later, he returned to the station, cut his way into a different storage room and looted $2,500 worth of tools. On May 14, he returned for yet a third time to the station, cutting a storage room lock and stealing more tools, valued at $4,000. He shifted to Franklin Avenue station on May 27, rifling a maintenance room and getting away with another $1,000 worth of various equipment equipoent. Two days later, he returned to Hoyt-Schermerhorn station, striking three more times in quick succession and fleeing with an undetermined amount of property, police said. Investigators probing the thefts say they have no suspects in the spree. Sources said many of the other 11 break-ins are similar to the Brooklyn pattern. But the NYPD declined to provide details about them because they have not yet been linked. 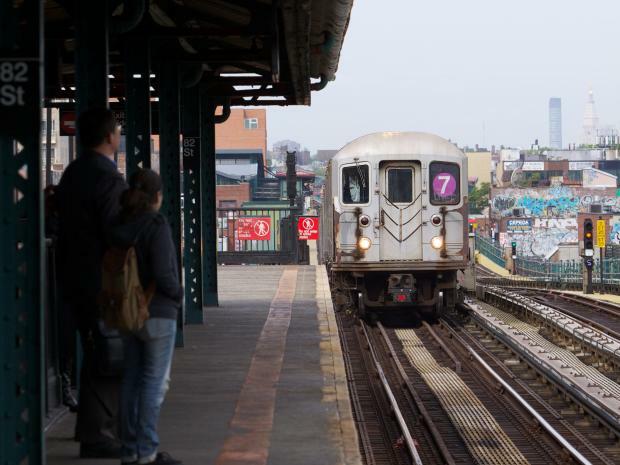 Meanwhile, crime in the subway system continues to rise this year, according to police statistics, with a spike in robberies and assaults last month. The latest figures through June 30 were released Monday at an MTA board meeting. There were 1,350 felonies committed in the subways during the first half of the year, a 15.5 percent jump over the same period last year, the data showed. The report also said the daily robbery average in June increased from 1.8 to 2.5, and that the daily felony average climbed from 7.2 to 7.8. For the first half of the year, the daily robbery average rose from 2 to 2.4 thefts, and the daily felony average jumped from 6.5 to 7 serious crimes per day, according to MTA data. Overall, robberies have climbed 23.3 precent, from 354 last year to 438 this year — thanks to 75 thefts reported last month, compared to just 53 during the same month last year. Police officials continue to attribute much of the spike to thieves targeting straphangers brandishing iPads, iPhones and other gadgets, which often sell on the street for more than their sticker price. Grand larceny is up 12.4 percent, from 707 to 795 this year. There have been five rapes, compared to two last year during comparable periods. In recent months, the NYPD has put a cop overnight on several lines running in the Bronx and in Queens. The additional police presence, coupled with conductor announcements that a cop is on board, has deterred some crime, officials say, and the initiative may be expanded.